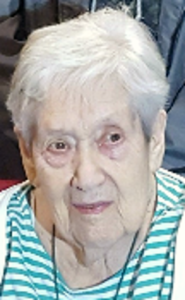 Edna L. Eichmann, 94, of Lancaster, PA, passed away on Wednesday, January 30, 2019. She was the wife of the late Donald F. Eichmann, who passed away in 1979. Born in Lancaster, she was the daughter of the late Edna Mae Lowery. Edna had worked in the offices of Charles F. Snyder Funeral Home & Crematory on E. King St. for 10 years. She was a 1942 graduate of J.P. McCaskey High School and was a member of Christ United Methodist Church of Lancaster. She loved dining out and spending time with her family. Edna is survived by her son, Donald F. married to Patricia Eichmann of Lancaster, her daughter Carol A.
Bree, and Bryson, her brother-in-law, Frank Eichmann of Lancaster and her nieces and nephews. We were so sorry to hear of your mom’s passing. May you find comfort in all your fond memories of her. You have our deepest sympathy. I am sorry to see of your mother’s passing. You and your family are in our thoughts and prayers. Thoughts and prayers to the Eichmann family. I am very sorry for your loss.